BikeSkirt » Blog Archive » Elf! My first ride on the Schwinn since getting her up and running was to the post office. I had packages to mail and they wouldn’t all fit in a backpack. So instead I bungeed the large one in the basket and put the other 3 on my back. I was wearing blue tights and fun boots and when combined with the large bow on the basket, I felt like a fun little elf! 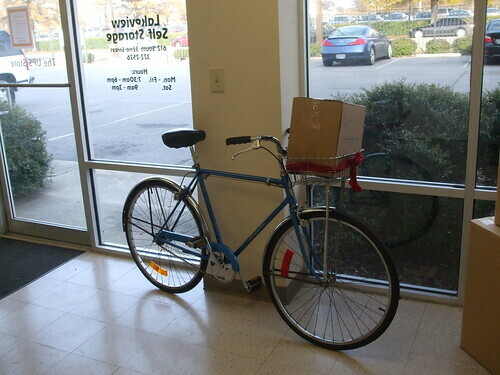 Have you been transporting packages and gifts via bike?